* Lime In The Coconut: Any ideas??? 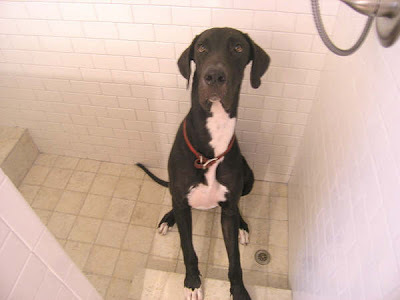 Oh my, I adore that bath! I kind of like the white walls... but I might find some graphic fabric for the window, rugs and towels and bring some bright color in that way. 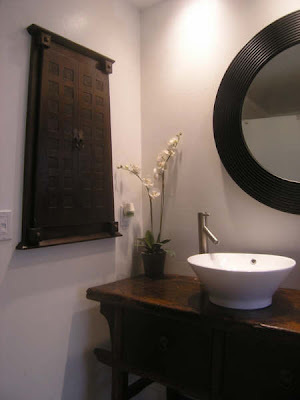 And yes to the sconces, they would look fab on either side of that mirror. Maybe Restoration Hardware? Honestly? I wouldn't do much more. It has such wonderful, clean lines that to add sconces would take away from the overall spa effect. Instead, what about a simple, oversized vase or a tall orchid to the right of the sink? Thanks guys!! Those are earlier pics...I do have a few things on the counter...keep trading them out looking for the thing that *fits*. Liz...never thought of a graphic fabric. Now you have my mind going. For big dog beds, check out Orvis...seriously. It's not just outdoors stuff. They have a great "Dog Book" full of awesome pet products and they cater to the bigger dog. bowwobeds.com also has an interesting solution...they make huge, heavy duty bed covers that you can stuff with whatever you want - pillows, old comforters, etc. The fact that my golden winds up on my bed more than on his makes me think he'd love a bed stuffed with my blankets. There's also www.bigdogboutique.com that caters to larger dogs. Linda, I fell in love with this gorgeous bathroom the first time I laid eyes on it. I wouldn't do another thing, it's perfection. I'll go have another look, but I really really like it, just the way it is. What about a capiz shell chandelier hanging above the sink? C'mon, you dont need any help! You are clearly a design genius! It looks amazing! You guys are the bestest!! I ask...you answer. Sarah...good idea..happen to have lot's of blooming frangipani in my yard right now. Upstart...thanks for that! I hadn't heard of a couple of those. We do have a couple of beds...he likes ours better! Pat, Stacy...Big smooches! I think I will play around with the window...and see where I go from there. I have a suggestion for you--come decorate my bathroom!! 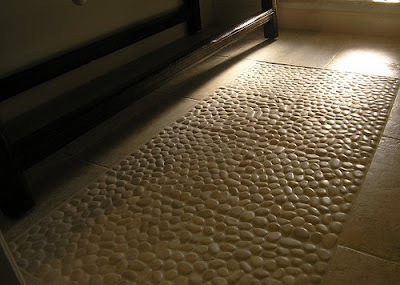 This is (I'm not joking here) exactly how I want to do my guest bath--right down to the river rock slab in front of the vanity. Perfection! If I had to make a suggestion, I would simply add an orchid on the counter or maybe some little succulants...succulents? You could do some sconces (I agree about Restoration Hardware), but they're not needed. Little, subtle punches of color maybe, but I really like the neutral-ness here. I'm serious--just beautiful! Okay. I hate that I can't look back at the picture while I'm typing. 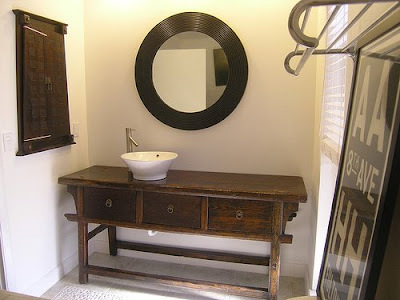 I just looked again, and I really think I chunky basket underneath the vanity would look great. Maybe some rolled up towels or toilet paper in it. Just a thought--you're doing just fine without us! This is GORGEOUS!!!! Do you really need suggestions? You seem to be doing alright by yourself!!! Ok...Chris...I did plan on adding a big ole' basket originally (great minds)Never found one. It is pretty small, so think I decided I like looking at legs as i'm sitting on the john (ok...maybe doesn't sound so good...but do you know what I am saying?). Yes on the orchid. I have some growing in my palms out back...but whenever I try and touch them or even talk about them...they revolt! French, I am sure. Joni...YES I need help, I am tired, I need new eyes, I love to scarf other peoples suggestions and call them mine. Got a problem with that? !